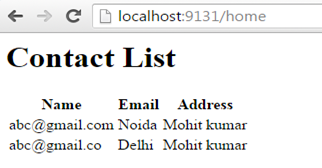 Create Partial View in MVC in Asp.Net and integrate as a reusable component in Umbraco CMS. 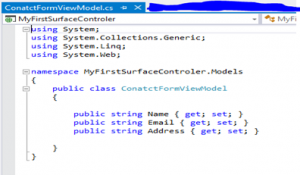 Partial view is same as a user control in Web Form application in Asp.Net .So it can be reused with in multiple views in MVC. Partial Views are special views which render a portion of View content. 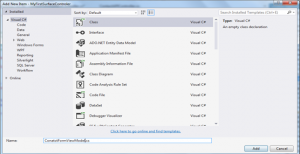 A) In Solution Explorer of visual studio, right click on the Models folder, select Add, and then select Class. 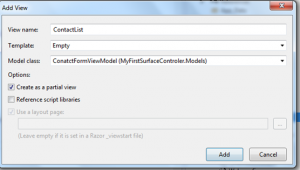 A) In Solution Explorer of visual studio, right click on the Views=>Partials folder, select Add, and then select View. In Solution Explorer of visual studio, right click on the Bin folder, select Manage NuGet Packages, and then install Umbraco CMS reference. 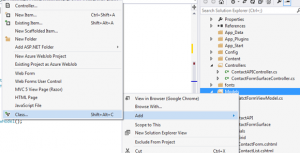 1) In Solution Explorer of visual studio, right click on the Controllers folder, select Add, and then select Controller. 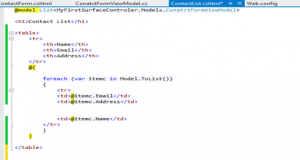 This controller (ContactFormSurfaceController) inherited by surface controller class not controller class. 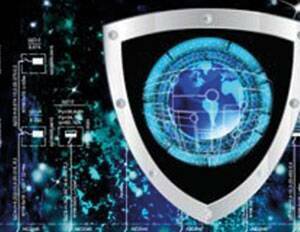 And this action return as partial view using following method. First build this Project then add Project DLL in Umbraco bin folder and Partial view in Views=> Partial folder in umbraco CMS. How to call Partial view in umbraco CMS Page ? For calling partial view we will write following code on the umbraco page.